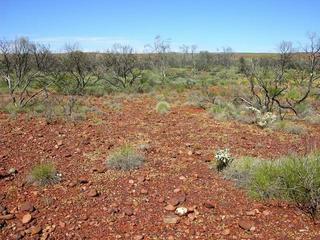 A fairly late start saw us heading south from Fortescue River towards the next confluence on Glen Florrie station. We refuelled at Nanutarra, then continued south, turning off on to the track through Uaroo, then heading east to Glen Florrie. I had talked to Susan a few days earlier, and she had said they would be mustering cattle at Tom Bore, a few km from the homestead. We arrived at the station in the late afternoon, and were promptly invited to dinner, and to set up camp near the homestead. Next morning, we followed Rob's suggested tracks, heading south, then west along a fence line. We were able to drive to within about 1.4km of the confluence. The walk in was over mostly level, rocky ground, with wildflowers and low scrub, and occasional shady trees. We took the usual collection of photos, then headed back to the station to collect the van, then continued west back to the North West Coastal Highway and turned south for the long trek back to Perth. We were all fairly happy with our efforts - our total for the trip was now five successful confluence visits out of the seven planned. The two we missed would now become the reason for yet another trip into the fascinating outback of Western Australia. #1: View of the confluence looking south west. #2: View from the confluence looking north.